My wife and I inherited an old trunk full of World War II documents, photographs and postcards when my wife’s grandfather, Jerome Davis, died. Davis was a scholar, Presbyterian minister, missionary and World War II correspondent for the Toronto Star newspaper. Among the items we located in the trunk were photographic glass transparencies of pre-war Japan scenes, postcards of war-torn Leningrad (St. Petersburg), a letter signed by Eleanor Roosevelt and a German soldier’s cap emblazoned with the infamous SS Death’s Head. What caught my eye, though, were several German ‘soldbuchs’ (soldier books). 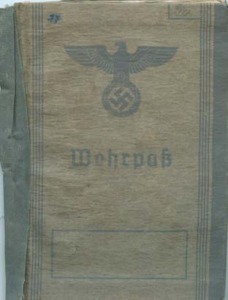 German soldiers used these small paper booklets to collect their pay. These documents listed the military units that the bearer served in, date and location of birth, parent’s names, citations earned and in addition served as basic identity papers. It appears that Davis collected these soldbuchs while reporting for the Toronto Star in Leningrad in late 1944, following the failed three-year German siege of the city. Davis then traveled westward with the advancing Soviet front as the Russians moved toward Germany. I firmly believe that Davis did not confiscate these materials as war trophies but gathered the soldbuchs so that they could be returned one day to the families of dead or missing soldiers. Many WWII German soldbuchs are sold for profit with no attempt to return them to their rightful owners. How could I ever find homes for these fading time capsules? Some scholars estimate that there were more than 18 million soldiers in the Wehrmacht, the German army, during World War II. How could I possibly find any relatives after 60 years? I know a bit of German, so with the help of an online translation service I was able to glean from the soldbuchs each of the soldier’s names, birth dates and birthplaces. I posted this information on a genealogy Web site, crossed my fingers, and waited. Within a few weeks I got a reply. Annelies Windisch (Lutzky) of Bernhardsthal, Austria, wrote me an e-mail indicating that a friend had told her about my genealogy posting. We corresponded for several weeks and by working together via email we finally determined that the soldbuch of ‘Obergefreiter’ Franz Lutzky was that of her mother’s first husband. Annelies informed me that Franz Lutzky was killed Sept. 21, 1944, in ‘Estland,’ or Russia, and was buried in Abja-Paluoja in present-day Estonia. This information corresponds with the German-Russian front moving west from Leningrad toward Berlin and dovetails with Jerome Davis’s movements covering the war in that area for the Toronto Star. Connecting with Annelies seemed like a miracle. Contacting her was like getting a reply to a message in a bottle. Within hours I had packed and prepared to send Lutzky’s soldbuch to her family. Before I sent the booklet, however, I told my in-laws about the enterprise and sought their blessing. I wanted to be sure that they were comfortable with the project because the soldbuchs were originally in their possession and they had lived through the war. More importantly, my mother-in-law’s brother, Paul Ekengren, 20 years old, was killed by Germans in 1944 at the Battle of the Bulge. With their blessing, I mailed Franz Lutzky’s long lost soldbuch to Annelies in Austria. A short time later, Annelies informed me that the soldbuch had been framed along with some of our email correspondence and was presented to her mother and her half-sister, Maria Pfeiler. A local radio station in Germany recently interviewed the family for a segment on World War II war widows. The Lutzky soldbuch and its unusual return home after sixty years were discussed during the radio interview. I’m happy to report that this mission had a happy ending, but the quest of returning the remaining soldbuchs continues for me. There are still five families to go and time is running out. The German Red Cross (GRC) indicated to me that they would like to take possession of the remaining five soldbuchs. I have decided to take one more year to search for the remaining families myself before turning over the documents to GRC officials. The names appearing on the yet-to-be-claimed soldbuchs are: Heinz Stapel, born Oct. 28, 1922 in Berlin; Theodore Lietz, born April 8, 1903 in Graz; Gustav Geiling, born May 6, 1913 in Popperrlauer; Karl Hahn, born April 22, 1905 in Vienna, Austria and Henri Storm, born Nov 11, 1921 – birth location unknown. Several years ago I posted the following message to a genealogy website (ancestry.com) about the identity papers of five German soldiers KIA or MIA in World War II (European theater of war) that came into my possession from my wife’s missionary grandfather (Jerome Davis) when he passed away…. I’ve come upon the identity papers for the following German prisoners of war from 1944. They most likely were in Canadian Prisoner of War camps. I would like to get them back to their families. Any help is appreciated. Thank you. Geiling? , Gustav born May 6, 1913 in Popperrlauer? Storm, Henri born Nov 11, 1921 in “wierk at darp”?? *I neglected to list Karl Hahn on the message. I was so happy to hear from you! My mother and the rest of my family is well. The soldbook and the way how we´ve got it – that means some of your messages – is decorated as a big picture and hanging in my sister´s entrance hall ( hall is a very huge expression for a rather small room) but she is very proud of it. All people who visited her had to look at the picture. In the meantime half of all the people living in the small village Bernhardsthal have admired it. If you plan to come to Europe what about coming to Austria? I live near Vienna (30 kilometers) and you can stay at our place for some days (a week) if you like. Your inquiry to the German Red Cross – searching service in München was sent to us on June, 18th 2002 to treat and to deal with it. As I know you are informed about that. Sending and keeping of estates of former German soldiers is only the job of our office. Information about former soldiers or their relatives can only be given, if the things which belonged to them are kept here in our office. I would please ask you, to send the papers of former soldiers which you own so that we can start the investigations. I hope you will understand that way of working, because there had been done a lot of nonsense and incorrect proceedings during the past. I want to say thank you for your efforts in this humanity matter. I think it is very hard to translate an information of an office because it is sometimes difficult to get the correct sense even when it is written in your mother tongue. But I think the paper says that they can only give information or having a look for somebody if the papers are in their office, because people often did a lot of bad things with properties or even information about soldiers during the past. I hope I could help you and I would be happy to hear from you. I think I´ll write a letter to this office and tell them, that we could get our soldbook from you and that we are very happy about it! By the way: I put the soldbook and some information papers we received from you into a frame and gave it to my sister as a present for Christmas. I wish you could have been able to see her face in that moment!